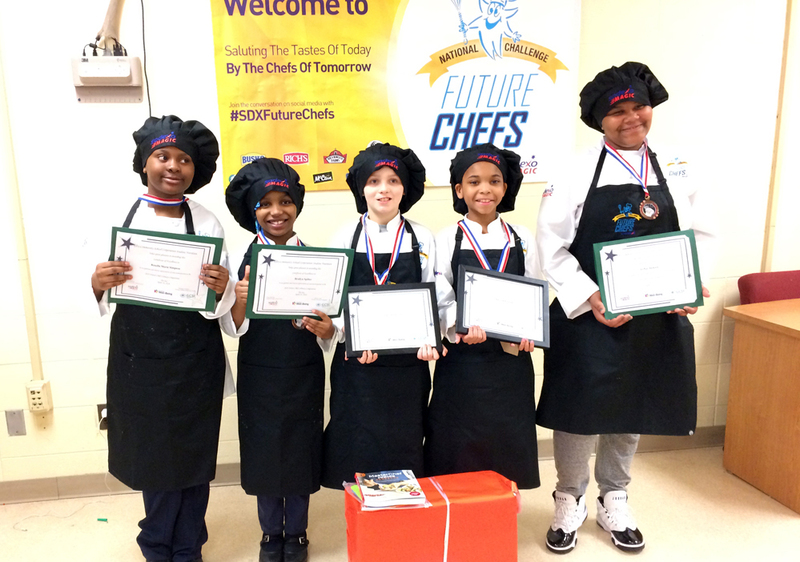 Gary schools students who love cooking and want the world to know, got a chance to show it in Sodexo’s annual Future Chefs culinary competition. Sodexo manages food service programs in school districts and institutions worldwide. The students, from third grade to fifth, are in the kitchen at home and say they want to get better. Rosella Simpson, from Williams Elementary, entered her favorite home dish Chicken Chimichangas. She loves the challenge. “I entered the contest because the more I compete the better I’ll get.” The 3rd grader even challenges her mom to cooking contests at home. Rosella’s looking forward to be a TV chef. She was a third finalist. LeNay Jackson is in the 4th grade at Banneker-Marquette. At home, she cooks chicken; spaghetti, deviled eggs, and she can barbeque. She also bakes. Her first chocolate cake came out perfect. LeNay’s entry was Seared Salmon with Spicy Sweet Potatoes. LeNay was also the third finalist. Passion Lawson, a fifth grader at Williams took first place with her Mexican Chicken Wrap, perfected from helping her mom make it at home. Passion will go on to the next round in Sodexo’s competition. Gwen Bush, Sodexo operations manager said the Mexican Chicken Wrap will be featured on all of the Gary elementary school menus in May.